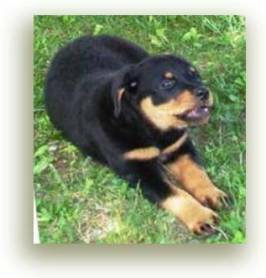 Rottweiler puppy biting - All puppies bite, so what can you do to stop it? Is it all fun & games, or something more serious? and lead to bigger problems down the road, if you don't put a stop to it now! Did you know that every part of Rottweiler training hinges on whether or not your Rottie views you as the "Leader Of The Pack"? That includes putting a stop to Rottweiler puppy biting. Puppy biting is a natural thing, but there are a few simple things you can do to make sure that when it happens, it's for the right reason, and that it doesn't become a bigger problem. So, why do puppies bite? For the most part, Rottweiler puppy biting is just good clean fun. Puppies play with their litter mates, and that's how they learn to play "nice". They learn from their brothers and sisters to not bite too hard, or no one will want to play them anymore. When a puppy comes to her new "human" home, she will still want to play and rough house with you, just like she did with her siblings. It's your job to continue the training her mother started . . .Rules are rules, they must be learned and then they must be followed. However, excessive biting, acting-out and failure to learn the rules may very well be a sign that your puppy does NOT view you as his or her leader. I would like to share an email that I received from a visitor about her puppies excessive biting, and my response back to her. Reba is a Rottweiler-mix puppy, and like most puppies she has her adorable moments. . . .And, her holy terror moments! Reba can be the sweetest girl one minute, and then the next minute she is possessed and is like a demon'ess from hell. She just makes a game out of it. I have even put her in her crate. If we ignore her, she just goes berserk and goes plum wild, and yelping in a high tone. Then nipping even more. . . . . I am worried I may have to put her down. I have an appointment in the middle of July to get her spayed, and I hope this helps. Plus I am moving to NY in August - So I hope, as I will have a big fenced in yard I can take her out into to play, that she gets a lot of energy burned off she will be calmer. And my son will not be around to play with her, giving her mixed signals. Plus Jeff and I plan to take long walks with her. Those are all very key elements to any type of dog training, but here's what I see in your other statements, this one being the key ingredient! She just makes a game out of it. I have even put her in her crate. and yelping in a high tone. Then nippingeven more. What you've got is NOT a dog that "needs to be put down" - you've got a bratty little pre-teenager, that does not view you as her leader, and has learned (actually she's been taught. . . .without you realizing it) exactly how to get what SHE wants.
. . . .So, what can be done about it? Reba's mom has her work cut out for her! She's not alone. . . this happens more often than not - I hope you can see that preventing this kind of behavior is much better and easier than trying to fix it later. If Janenne wants to pet Reba, she needs to make her do something to earn it - Sit, lay down. . . something! If Reba walks up to Janenne and demands attention, or play or whatever, Janenne needs to make it on her terms, NOT Reba's. Janenne needs to completely ignore her until she gives up. Make her go lay down, and as soon as she does as she's told, then go initiate attention or ball playing or whatever. If Reba doesn't give up, then she needs to be put in her crate until she can be calm and behave properly. If she goes wild and howls at a high pitch, then put some ear-plugs in and ignore her. Letting her out of the crate while she's behaving like that will only reinforce her bad behavior! When Reba bites, or nips or is generally "out of control" she needs to be put in her crate and stay there until she is calm. Leaders LEAD, followers. . . . FOLLOW! Every single thing that Reba wants, needs or does must be on Janenne's terms - period! The entire family must employee consistency and follow-through. There is no exception, or Reba will continue to know what she can get away, and what she can't.